Vatican City (Agenzia Fides) - In yesterday's audience with Cardinal Angelo Becciu, Prefect of the Congregation for the Causes of Saints, the Holy Father Francis authorized the promulgation of several Decrees, including the martyrdom of Alfredo Cremonesi, a member of the Pontifical Institute for Foreign Missions, (PIME). Born in Ripalta Guerina (Italy) on 16 May 1902, Alfredo Cremonesi was killed in Myanmar, where he had worked for 28 years, on 7 February 1953. Fr. Cremonesi became a victim of the conflict between government troops and the Karen rebels, fire was set to the missionary's house and the convent in the village of Donoku, and a soldier shot Father Alfredo between his eye and his temple. Previously he had been invited to leave that very dangerous place, but he preferred to remain among his people. He had spent a lifetime of prayer, of mortification, of total giving to the poorest and most abandoned, covering great distances on foot to announce the Gospel to non-Christian tribes. The Bishop of Crema, Mgr. 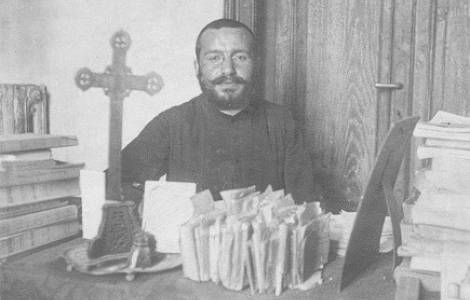 Daniele Gianotti, gave the news of the first martyr in the history of this diocese: "We give thanks to God, who gave our Church in Crema, and to the whole Church, the testimony of a martyred missionary". The Bishop informs: "God willing, we can celebrate the solemn beatification liturgy of Fr. Alfredo, in Crema, next October: it is the missionary month, which in this year 2019 Pope Francis wanted to characterize as extraordinary missionary October ... and the testimony of Fr. Alfredo will be able to help us keep the fire of the mission alive in us, the desire to bring the good news of Jesus Christ to everyone". Thanking all those who contributed to the cause of beatification, the Bishop invites the priests to give news during the Masses next Sunday, March 24, "in a spirit of gratitude to God and a renewed commitment to live and bear witness to the Gospel of charity; and asking once again to God, through the intercession of Fr. Alfredo, the grace of the release of our very dear Fr. Gigi Maccalli".